Business Ethics – An Oxymoron? | Fulcrum ConsultingWorks Inc.
Business Ethics – An Oxymoron? Business scandals that contradict espoused core values are all too common. Becky highlights a few reasons why that happens, and asks each of us to look in the mirror. 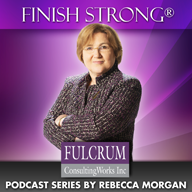 This entry was posted in Current-Events, Podcast Series: Finish Strong® and tagged Economy, Leadership by Becky. Bookmark the permalink.